It is helpful to look on the brighter side of life, particularly at those times when there is little light to see by. Positivity is a valuable asset in the dark. In fact it is priceless, at all times. Without foresight it is not a simple business, being optimistic. You need to be able to envision the best outcome, every time. That involves interpreting the big picture. Not translating it, or explaining it away. There is always time to hope for the best to happen. It costs nothing, that kind of positivity. It does mean heartache, that is inevitable in a world where appalling things happen uninterrupted all day, everyday. An open heart is susceptible to aching. When you want the best for everything that is deserving of it – and again, deserving being a big word – it is a challenge to accept that in this life we do not all necessarily get what we want. 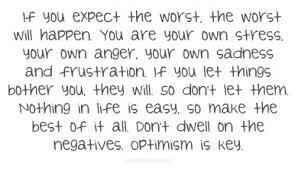 There is no such thing as being too optimistic. We are all highly evolved creatures, we can see beyond the daily dire and dismal to where this world really is a better place for all that have a vested interest in its wellbeing. Fortunately there are still many optimists all over the globe practicing their positive influence on people and their purpose – and for them, we should all be grateful. Without their foresight this planet would not be where it is going.